Born in 1921, John Keavey embraced the sport of cycling in his teenage years. Cycling was more than just a sport. Cycling clubs provided a way for people from differing towns and villages across the north of England to socialise together and to escape urban life. 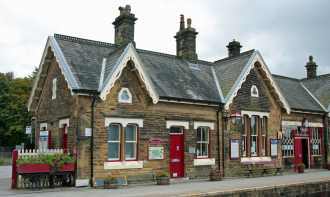 John was also fascinated by the history of transport and was very involved in saving the Embsay to Bolton Abbey Railway. John's enthusiasm for trams, trains and cycling really is a ‘must have’ for anyone interested in how transportation impacted on everyday life. Extract 1 John Keavey, Cycling and the Middle Classes. John explains how the cycle moved from its role as transportation for a select few middle class occupations to that of being embraced by the working class mill and textile workers of the region. Extract 2 John Keavey and a Cycling Club Run. A breakdown of an average club run, the importance of the size of your tinned fruit and his first encounter with the cycling ‘men in black’. Extract 3 John Keavey and Leeds Trams. Trams are the focus here. John describes how he saved his tram fares by running through the centre of Leeds to the library all in order to save up to purchase a new map for cycling club. Also how a school boy would ‘lose face’ if he moved inside away from the open top section of the tram—regardless of the weather conditions! Extract 4 John Keavey and the Railways. Train networks provided opportunities for industrial working class communities to visit the seaside and for commuting to work. Extract 5 John Keavey and Yorkshire Folk. Differences between the communal characteristics of industrial communities are explored. Click here for ideas for teaching A 1930s Childhood to KS1-3.